This is probably the only example left of a 6x6 Awd heavy tractor originally designed as a tank transporter. I do not know its exact model description but do know that it was offered to the MOD as a replacement for the Scammell Commander. Seen at Gailey, Staffordshire, England in August 2002. This was the one and only prototype Tank Transporter. It nearly won a large export order form Nigeria but the money wasn't forthcoming. It is pure TM - a development of the KTX range. It was designated TT 120-40 having a Gross Train Weight of 120 Tonnes and a 400 hp(nominal) Turbocharged Cummins 14 litre engine with a nine speed Fuller gearbox. The axles are of Kirkstall design.The cab is a TM Full-width but not tilting. 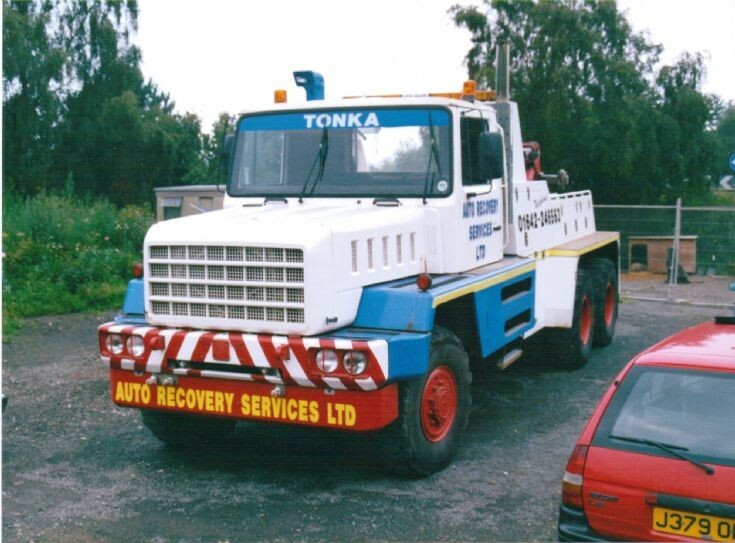 Registered K7 AWD, it is still at work based in Northern England. It was the largest truck to be built at Dunstable. Can post more details if anyone is interested. Added by Peter Goodall on 07 August 2014. Yes if you could supply as much detail as possible. I'm a collector/restorer former operator of many Bedford's and are planning in near future of building one up. Added by Richard Munford on 01 April 2019. Added by Kevin Welch on 02 April 2019.